The 1st page you displayed at the top of this page came up and my movie title was displayed, in the proper place, but all the windows were grey and inactive so I couldn’t make the changes you suggested. What’s the problem? Also, my project is in Standard Definition. I don’t have HD. Is that a problem? I originally had made an Mp2 file for making DVDs and had loaded this on to my server so that the video could be downloaded by customers. The file was so large 2.63gb [53min] that it took forever. Several friends suggested that I change to an Mp4 file instead to lower the file size. Then one of them referred me to your website. Can you help me? And by the way what would be the final file size if I go this way? If this works this would really make my day and you would surely be a hero in my world. 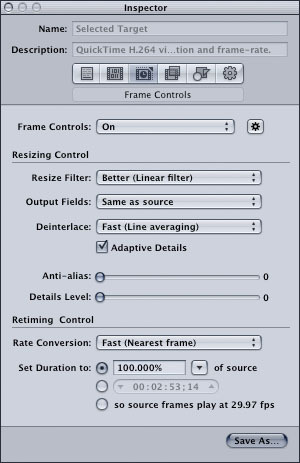 @Hugues I wrote this post a year and a half ago and use variations on this preset several times a week. I have yet to encounter a situation in which this doesn’t work. If you find that it doesn’t work for you, please let me know what the application is. 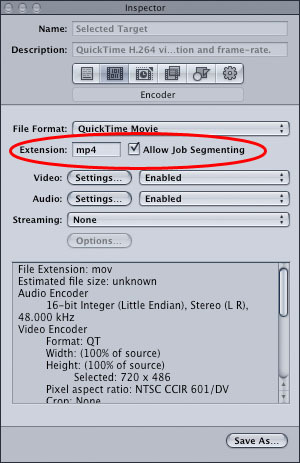 The MPEG-4 preset in Compressor uses the “MPEG-4” video codec, not H.264, so I definitely do not mean use the MPEG-4 preset, unless for some reason you need to use the MPEG-4 video codec, which I have never needed to do. 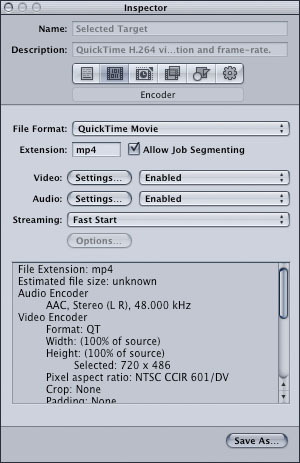 For web video, H.264 is the preferred video codec, and I prefer to have it an MP4 container rather than an MOV container. That’s what changing the extension does. 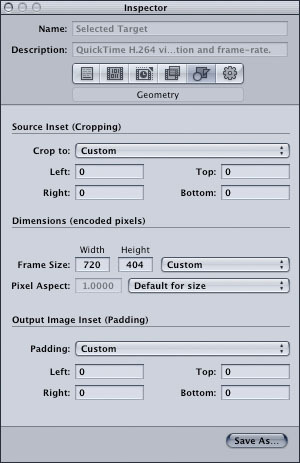 There are Compressor presets for Apple devices such as “H.264 for iPad and iPhone 4” which give similar results, but you get less control over the various encoding options, so I like to use this custom preset. Thanks a lot. That works great, and that helped me truelly in my job. i’m not 100% sure, but i think i’ve sometimes encountered problems in the past when renaming .mov to .mp4 and trying to play them back on a sony bravia tv. still, works most of the time, so maybe i just messed up the encoding settings for the files that didn’t work. i never cared about the “frame controls” option for a straight render (and i guess, they don’t matter if you don’t change resolution, timing, interlacing,…), but i definitely have to play around with the “fast start” option. one other strange thing i noticed – when resizing a 1080p file to 720p i get a file with 1280×720 (1248×702) in quicktime – what’s with this 1248×702? – some strange aspect ration? – the file works fine so far. Very helpful. Nicely written blog. Thank you Kyle. THANK YOU, KYLE! This was a priceless piece of information. 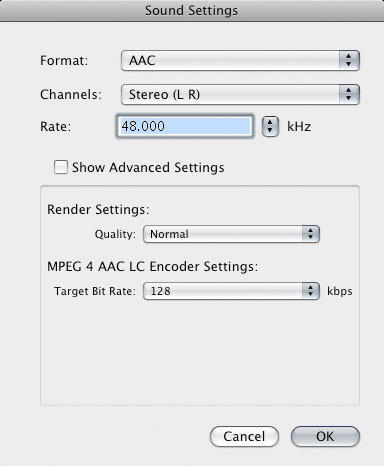 i have a prores 422 (source) file straight out of fcp. it s 1’40” long film and comes out at 1.31gb. when i do so, the new file still won’t open in QT and when played in mpeg streamclip looks darker and kind of sharpened. ok.. replying to myself here. i think my MBP was switching graphics cards and (gfx) and a restart has meant that all my earlier various compression attempts DO open in quicktime and look good. your guide is good tho!! sorry to take up space on the blog!! 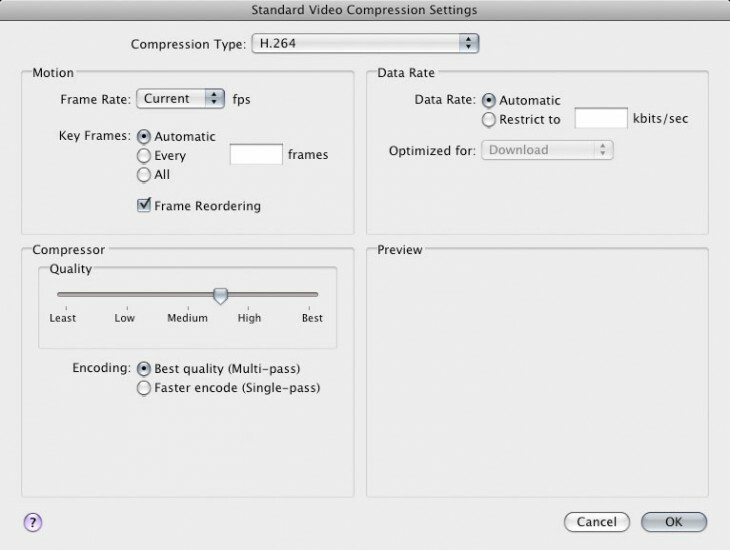 With Compressor 4 you can just choose the MPEG-4 Export instead of Quicktime Movie. It now works with H264 (both Main and Baseline). 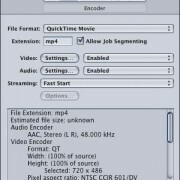 This mp4 files automatically has fast start and the headers are at the beginning. The Thunderbolt Logo Looks Like Electricity FCP X: What do we do now?